FAR HILLS, NJ (September 20, 2017) – New Jerseyans of both political parties overwhelmingly support renewable energy like wind and solar, and agree the state should adopt a goal of having 80% of the state’s energy come from such sources, according to a new poll released today and conducted by Fairleigh Dickinson University’s PublicMind™ for ReThink Energy NJ. “While many of our current leaders in Washington deny the threat of climate change and promote fossil fuels, New Jerseyans take a very different view, and want clean, renewable energy, not more polluting fossil fuels,” said Tom Gilbert, campaign director, ReThink Energy NJ and New Jersey Conservation Foundation. Nearly 90% of those surveyed believe renewable energy is important to the overall health of New Jersey, and nearly 75% are willing to pay $5 to $10 more per month on their energy bills for energy generated from solar and wind. Not only are New Jerseyans highly supportive of renewables, they are more accurately defining which energy sources really are clean. There was a significant drop from last year in the number of people who consider natural gas, a fossil fuel like coal and oil, to be clean energy, to 41% from 62% in a PublicMind™ survey taken around this time in 2016. “The overwhelming support for renewables shows that voters clearly know what sources of energy they want more of, and it’s not gas,” Gilbert said. Approximately four of five (78%) New Jerseyans favor a goal of 80% renewable energy in New Jersey by 2050. 77% believe the state should invest more in developing clean energy sources rather than fossil fuels and pipelines (22%), with three in five (64%) saying New Jersey is moving too slowly in this area. Three-fourths (73%) favor developing off-shore wind energy off the coast of New Jersey. 54% say a gubernatorial candidate’s support for renewable energy would make them more likely to vote for them, including 69% of Democrats and 49% of Independents. 87% are concerned about the seizure of private property for pipeline construction. Eight in 10 (79%) are concerned about the potential threats to public safety from pipeline ruptures or explosions. 80% are concerned about the risk pipelines pose to air and water quality, and 86% are concerned about the impact on natural areas and wildlife habitats. Three of four (77%) are concerned about pipeline development’s role in causing greenhouse gas emissions that contribute to climate change. Nearly seven in 10 (67%) say the number of jobs created through pipelines are not worth the environmental and health risks pipelines create, and that instead jobs should be created through clean, renewable energy projects. Climate change continues to be a strong concern among New Jersey voters, with three quarters (76%) “very” or “somewhat” concerned about it. 64% attribute climate change to human activity, more than double the 36% who consider it mostly a natural pattern. The findings of the poll are consistent with others over the past three years. Support for renewable energy stays strong among all demographic groups, with women, younger voters, and Democrats showing more support than men, older voters, and Republicans. “New Jerseyans have strong feelings about our environment, and we’re seeing those sentiments get even stronger in our poll results,” said Krista Jenkins, director, Fairleigh Dickinson University PublicMind™. “On the heels of recent devastating weather events like Hurricane Harvey, concern with climate change in our state went from 69 percent to 76 percent in the last year alone,” Jenkins added. 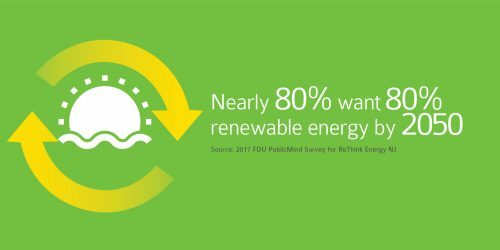 The telephone survey of 705 randomly-selected registered voters was conducted by PublicMind™ for ReThink Energy NJ between August 25 and September 7. View the full report here.